The following article was kindly supplied by Wing Cdr. 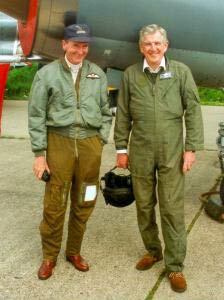 (retd) Brian Carroll, who has flown the Lightning in both RAF and RSAF service, and also flew the F-15 in RSAF service. As such he is one of the few pilots qualified to compare the two, and I think it makes interesting reading. Brian was one of the pilots called in to fast-taxi preserved Lightnings, and could often be found at Bruntingthorpe in XS904 or XR728 or at Cranfield in XS458. Sadly he passed away in December 2004. This article is presented in his memory. Quite where to start is difficult - two high performance aircraft, but from differing eras. The Lightning concept dates back to a period just after the end of WWII, though it was not until 1947 that an experimental study contract was approved, and another two years before a contract was given for two prototypes and an airframe to be used for static tests. The P1 took to the air on the 4th of August, 1954. With that in mind, it must be appreciated that a gap of some 18 years exists separates the development of the two aircraft, so some of the differences are bound to be significant. The F-15 Eagle was barely on the drawing boards in 1967, though by 1974 it was challenging the MiG-25 "Foxbat" for various climb to height records and also the absolute altitude record for this type of aircraft. A little more of that later on. How then do the two aircraft compare from the pilot's seat? Bearing in mind my limited experience of the Eagle, compared to many years flying the Lightning, I may miss out on a few pertinent aspects. Nevertheless I will attempt to be as objective as possible. No doubt any Eagle pilots who read this will have different views. The F-15C Eagle is a single-seat high-performance, supersonic, all-weather air-superiority fighter built by McDonnell Douglas Aerospace. It relies on its excellent design features as well as state of the art avionics to keep it at the pinnacle of world-wide fighter capabilities. The Eagle was designed to fix all of the problems that were discovered in building the F-4. The Eagle is a high-mounted, swept-wing fighter with twin vertical stabilisers. The wing design and twin tails give the Eagle excellent flying qualities throughout the entire flight envelope. My first impression of the Eagle was of its size - it's a large aircraft, bigger than the Lightning in every aspect, especially inside the cockpit; so much room that one could nearly walk around compared to the glove-like fit of the Lightning. Even so, everything came to hand without having to stretch, in fact all essential control functions could be accessed either from the stick, or the throttle, in all there are 15 multi-functional buttons and switches. Having said that, the Lighting too was well supplied with such facilities, though they were spread a little wider, and there were more of them. At least 22 primary ones and several others were scattered around various parts of the cockpit. There was a certain amount of rapid hand work needed from time to time, and considerable dexterity needed to ensure the hitting of the correct switch. Embarrassing if one was to switch the radar off at a critical moment. I never did. Starting systems on both aircraft were straightforward, taxiing out needed some braking since they would both gently accelerate if not held in check. Now onto the runway for take-off. Acceleration in both was impressive, you have all seen the Lighting leap away once brakes are released, the Eagle was almost as good, and climb speed was rapidly achieved. Take-off roll is between 2,000 & 3,000 feet, depending upon MIL or MAX AB powered takeoff. The Lightning was quicker off the ground, reaching 50 feet altitude in a distance of 1,630 feet, and a climb speed of 450kts in 61.8 seconds. The Streak Eagle set the time to climb record in 1975 of 207.8 seconds from brake release to 30,000m (98,425ft). The Streak Eagle also beat the Apollo Moon-shot rocket up to about 50,000ft! Keep in mind that that was a modified Eagle on the coldest day they could get, and a precise profile was flown. However, it gets across the capability of the F-15. The range proficiency of the F-15 is impressive, with three external tanks it can cover about 2,500nm. Compare that to the Lightning's figures, on standard internal tanks (filling the over-wing tanks prior to take-off gave no advantage, the extra weight burned off so much fuel that it was never practised unless a low level only trip was planned, otherwise in flight refuelling was the norm), the maximum attainable range was (and this was stretching things a bit) 900 miles. Even this required a cruise let down to conserve the juice. If nothing else it emphasises the shortage of fuel that British fighters have always suffered. My first F-15 flight involved a formation take off, and here I discovered the first difference. The Pratt & Whitney engines (turbofans) were slow to react to throttle movement, so maintaining a steady position on the wing of my lead aircraft took a few moments to sort out, otherwise it presented no difficulties, and I was soon relaxed and enjoying the flight. Controls are beautifully balanced and very responsive, this applies to both aircraft. I might add here that the latest F-15s have Pratt & Whitney F-100 or F-220 engines. These are turbofans with a 5 stage afterburner capable of burning fuel in excess of 100,000pph. The newest motors (-220) have a Digital Electronic Engine Control (DEEC) that gives the engines faster response times to throttle demands. Each motor produces about 20,000lbs of thrust for a total of about 40,000lbs. This compares to the Lightning which produced 32,600lbs of thrust in full burner. (22,200 in cold power). 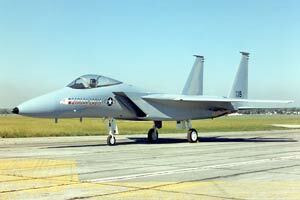 For the F-15, typical training configuration weights are around 45,000lbs. Combat load is closer to 55,000lbs. This compares to Lightning figures nearer to 41,700lbs max. take-off with full combat load. The brief for this sortie was a 1 v 1 radar interception profile, followed by 1 v 1 Air Combat Manoeuvres (ACM). I now experienced a whole new world of avionics. This is where the Eagle is head and shoulders above its peers. The Eagle's avionics are centred around the APG-63 Pulse-Doppler Radar. This is the eyes of the Eagle. The Radar is interleaved with High and Medium PRFs which aid in its detection and allow it to still be the best Air-to-Air radar in the world today. The Eagle also has a Radar Warning Receiver which alerts the pilot to enemy radars in various modes. On the defensive side, the Eagle has a counter measures dispenser which allows it to deploy both chaff and flares for its own protection. The Lightning's on-board radar was to say the very least basic, and hard work to operate, the phrase "a one armed paper hanger" comes to mind. The Lightning had no defensive counter measures, something that we would have appreciated. By comparison the F-15's kit was simplicity itself to use. All the requisite information to carry out an interception was displayed on the HUD. Details such as the targets speed and height were digitally shown, along with its heading. Should the target throw a turn, the display informed you of the direction of turn, also the amount of 'g' he was pulling. 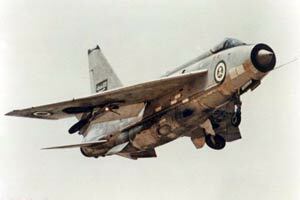 Pick-up range was far in excess of the Lightning's AI, and in the lower levels, ground returns were virtually non existent, making interceptions a more viable proposition. Weaponry - the Eagle can carry 8 air-to-air missiles and has it own internal 20mm cannon. The gun carries 940 rounds and fires at a rate of 100 rounds per second. The short range missile that the Eagle carries is the AIM-9M Sidewinder. This is an IR homing missile and used for close-in combat as it has a short range. The Eagle can carry up to 4 of these on the wing pylons. The long range missiles for the Eagle are the AIM-7M Sparrow and the AIM-120 AMRAAM. These missiles allow the Eagle to reach out and touch the bandits at longer ranges. The Eagle can carry up to 4 AIM-7Ms on the fuselage and up to 8 AIM-120s on the fuselage and wing pylons. Typical combat load is 4 x AIM-120, 2 x AIM-7, 2 x AIM-9, and 940 rounds of 20mm. By comparison the Lightning was poorly armed, carrying only 2 missiles and two 30mm cannon. The F-53s could also fit bombs and rockets, but basically its weapons load was no match for the F-15. Manoeuvrability in the F-15 during the 1 v 1 was outstanding throughout the entire flight envelope from less than 100 knots in a BFM engagement, to more than Mach 2.0 interceptions, and I have no doubt that the Eagle would be more than a match for the Lightning. With so much thrust, optimum manoeuvring speed was easily maintained, with little if any need to unload in order to maintain it. On completion of the air exercise we recovered as individuals, thus giving me the opportunity to get a feel of the aircraft without having to concentrate on the leader. Although this was my first trip, I felt completely at home with it. It was simply a splendid aircraft to fly - like the Lightning, a pilots machine. The recovery was uneventful, electing for a instrument approach using the ILS system. In the same way as the Lightning, the Eagle was easy to trim for the approach and descent, once trimmed, it rode the rails like a thoroughbred, which indeed they both are. Landing was straightforward, the aircraft settled easily onto the tarmac, slowing well with aerodynamic braking, a procedure not generally employed in the Lighting, both aircraft have brake chutes, and as we all know are most effective. The overall impression was that both aircraft had very similar performance and handling characteristics, both were a joy to fly. Considering the age difference, the Lightning's performance was totally outstanding when introduced into service, and when it finally bowed out, it could still out-climb most of its successors. Its initial rate of climb was 50,000 ft per minute. The Mirage IIIE climbed initially at 30,000 ft per minute; the Phantom F-4M managed 32,000 ft per minute; the MiG-21 could only manage 36,090 ft per minute; the F-16A's initial rate was 40,000 ft per minute, and the Tornado F.3's 43,000 ft per minute. So the Lightning reigned supreme. Only later was it surpassed; the F-15 Eagle, and the MiG-25 both have initial climb rates as good or better. The Lightning's time to FL 360 in re-heat was 2.5 minutes, in this respect the Eagle produced a similar figure, though this could vary depending upon its configuration. Having made an attempt to compare the Lightning and the F-15 Eagle, and to give my personal impressions, and having also mentioned the MiG-25 earlier, a few words about that aircraft may interest readers. It was, and still is, quite some machine. The MiG-25 has a very similar profile to the F-15, but it was around and flying in June of 1967, in fact the Russians had four prototypes, or pre-production models by June 9 of that year. Even earlier there were reports in 1965 of what was designated the Ye-266 which was snatching every known record of speed, time to height and absolute altitude. The Ye-266 was in fact a stripped-down MiG-25 fighter prototype, and at that time no one knew what they were. Referring to the 1967 appearance of the MiG-25, it was on the scene when the F-15 was barely on the drawing board. It was engined by the R-31 Turmanski Turbojet, initially producing 25,000 lbs of thrust, later increased to 30,000lbs. The tail pipe diameter of each engine was 4 ft 9 inches, seriously large. By late 1969 in went into production and by 1972 there were three versions in operation, the Fighter Bomber, the Interceptor and the Reconnaissance versions, all fully operational. Around that time the Israeli radar tracked high-flying MiG-25's on Egyptian sponsored snooping missions over the Sinai peninsula cruising at Mach 2.8 and on one occasion at Mach 3.2. Neither the Israelis nor the Americans had anything at that time to touch them. Two years later an F-15 managed to wrest the Foxbat's time to height records, but not for long as the Ye-266 with the up-rated engines lead the field again. A pilot by the name of Aleksandr Fedotov reached 114,800 feet in 4 minutes 11.7 seconds. That was on 22 July 1973 and five weeks later, zoomed to a new absolute height record of 37,650 metres. The "Streak Eagle" has achieved 100,250 feet. The surprising thing is that the engines remained alight at such a height, virtually no oxygen and very limited airflow to keep things going (I once had a F.53 Lightning up to 87,300 feet over Saudi, and it was really on a knife edge, both engines remained alight, but were very touchy, and getting down to a more reasonable and sane altitude needed delicate handling. Earth curvature was visible and the sky was quite dark. So another 27,000 feet is quite something). Endurance and combat radius were quite a problem for the MiG-25, something in the order of 750 miles in cold power and a combat radius of only 350 miles. If and when they pushed to 3.2 Mach, the engines were shot, their usual briefed limit was 2.5 which could be achieved with a full weapons load. Going any faster risked the engines accelerating out of control until they cooked, so I guess discretion was the watch word. With high wing loading the aircraft was limited to around 5g and only 3.5g with full tanks. This was a severe limitation for a fighter, and must have been good news for the West when they were made aware of the various limitations, and when subsonic any other fighter could out-turn it. All the performance data etc. were revealed when the Russian Victor Belenko defected with his MiG-25 to Japan on 6 September 1976. It was as you probably know stripped down, examined and then put back together before being returned to the Russians. The crude build came as no surprise, and the avionics were hardly state of the art. The aircraft skin was primarily a steel alloy, this imposed a severe weight penalty, but was done to save on costs, titanium skinning was only used in areas subject to high friction. A lot of spot welding was employed as there was a shortage of skilled riveters. Where rivets were used, they left the heads protruding for added strength. Another of the problems they encountered was sourceing suitable canopies, seals, hydraulic fluids, tyres etc. that could withstand high temperatures. (300°) Alcohol cooling was used, stored in a 500 litre tank, this gave the MiG-25 the nick name of the "Flying Restaurant". Apparently the alcohol used was purer than the Vodka on the base. They developed a powerful air conditioning system to keep the pilots cool. Semi-conductors would not work above 65°C, so they stuck to using vacuum-tube avionics, even for the radar. It was a monster item of equipment, weighing in at slightly over half a ton. Its pulse-Doppler search and track were basic, but the valve technology and its awesome power gave it unmatched power to burn through the thickest electronic jamming to a range of fifty miles, it would kill a rabbit at one kilometre if activated on the ground. To finish up, my conclusion has to be that given the choice between the F-15 and the Lightning, I would have been mad not to take the Eagle, but only because it has such superb avionics and weaponry. For the pure joy of flying, the Lightning still heads the list. It was and indeed still is a magnificent aircraft, and a credit to the designers and test pilots who developed and brought it into service for people like me to enjoy.